Do you ever have an idea months or years in advance for a gift you might make for someone given a certain eventuality? Maybe the perfect wedding gift for a friend/relative who’s not even engaged yet, or a Christmas gift that will be perfect for someone, someday? I have a few gift plans like that, in particular, ideas for baby gifts for friends who are nowhere-near-pregnant. 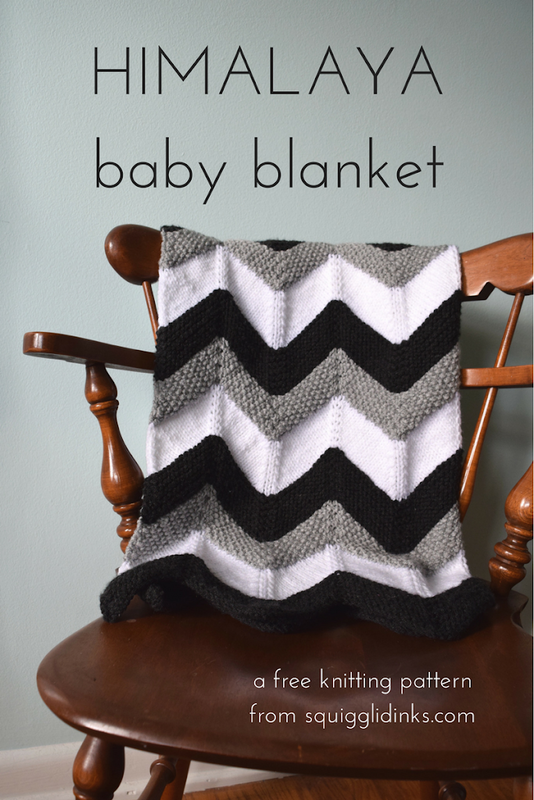 I originally saw this textured, striped baby blanket on Pinterest and thought it was so simple and sweet. I knew that my friend liked gray neutrals, so I decided that whenever she told me she was pregnant, I’d make it for her little-one-to-be in grays. 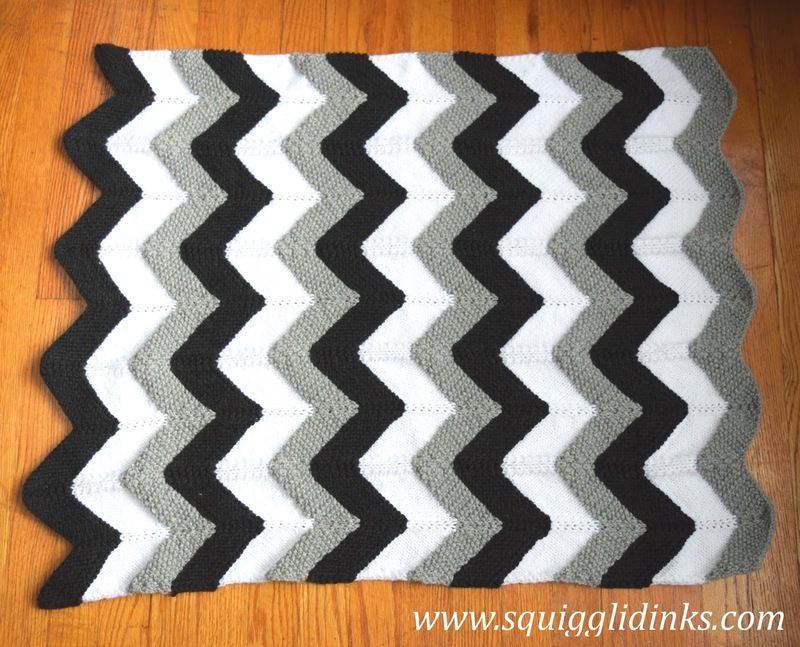 Then, after I heard the good news and bought the yarn, I saw a few of her Pinterest boards and realized that a lot of the nursery idea pins she was saving had gray chevrons. 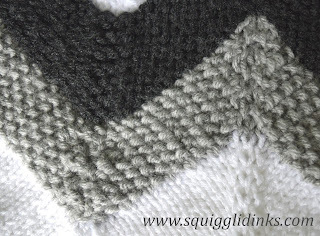 I wanted to combine the textured stripes of the first pattern with the chevrons. It took a little work to figure out how to make seed stitch chevrons work, but I think it turned out well. It ended up looking a bit like snowy mountains (hence the name). We’re still waiting for her little one to arrive, but the blanket is ready to go when he does! 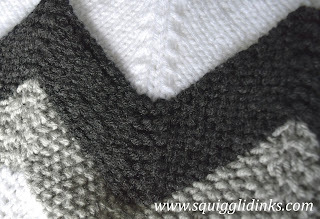 The pattern is written for a baby-size blanket, but if you want a larger blanket you can either increase the needle size/yarn weight or cast on more stitches and repeat the color pattern more times. 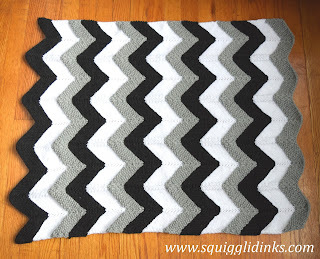 This pattern is also available as an inexpensive printable, ad-free PDF via Ravelry. Size 8 circular needles (anything longer than 16”) – You’ll be knitting the blanket flat, but you need the length to hold all the stitches. Big Twist Serenity yarn (worsted weight) from JoAnn Fabric in 3 colors – I used Charcoal, White, and Light Gray, 1 skein (322 yds) each. Stitch Markers – I used 9 for this size, but if you’re making a bigger blanket, you’ll need more. 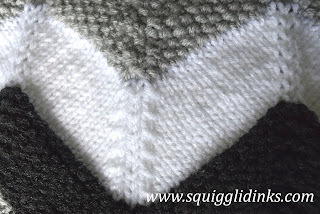 Knit 1 row, placing a marker after 16 stitches, then after every 15 stitches until the end of the row. Row 2: knit, slipping markers when you come to them. Repeat these rows a total of 7 times (you should have 14 rows in this section). Row 2: purl, slipping markers when you come to them. Repeat these rows a total of 6 times. Knit Row 1 once more so that you end on a RS row (you should have 13 rows in this section). Purl 1 row, slipping markers when you come to them. Repeat these 3 color sections a total of 5 times. Bind off in the pattern stitch when you come to the final row 2 of the Color 3 section. Non-textured – If you like the chevrons but not the different stitch patterns used for each stripe, cast on as directed and place markers, but purl that first row instead of knitting. Then follow the instructions for Color 2 throughout the whole blanket, changing colors every 14 rows. Color 1: Knit all rows. Color 2: Knit first row, purl second row. Repeat these 2 rows for 13 rows, ending with a knit row. Color 3: Purl first row. Next 13 rows: k1, p1, repeat to end. If you’d rather have a PDF version of this pattern, you can download the inexpensive ad-free PDF via Ravelry. What colors will you use for your Himalaya blanket?